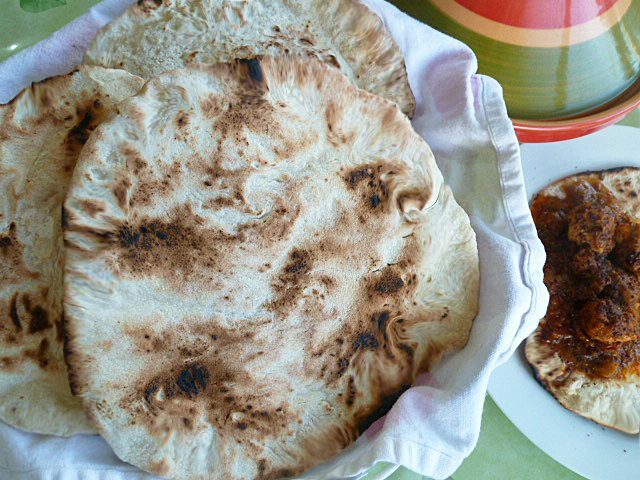 Taboon bread, also known as Lafah bread (and probably a few other names too), is found all around the Middle East in various manifestations. It is, as I’ve posted before, the bread used for Musakhan, it is the bread used to wrap Shawarma and is also quite often stuffed with falafel and humus. You can split it to fill it, or you can use it as is. While I had eaten taboon bread many times before, it wasn’t until a trip to Egypt many years ago, that I came to fully appreciate it. The name taboon refers to the oven used to bake the bread, and is a tradition that goes back to biblical times. It can be either an underground oven or an above ground, dome shaped clay oven. I was travelling with a Palestinian friend and was visiting her family when I first came across the taboon (or tabun). I was completely captivated by the whole process – the floor of the oven was covered in large pebbles (I think she said they were made of marble) which were above smouldering hot coals. The flatbread were placed directly over the pebbles to cook, resulting in indentations on the underside of the bread. Besides the bread, there were also a couple of other types of food in metal containers cooking along in the taboon. Brilliant, really. Of course, unless you’re cool enough to have a pizza oven, we are just going to have to do our best with an ordinary one! There are so many ways to try and recreate that charred, smoky flavour that comes from using an oven like that. you could place a couple of pieces of burning charcoal on the bottom of your oven (in a heatproof container), seriously, just like making mandi – recipe soon! Now if you have a pizza stone, that will do nicely for baking this bread on. 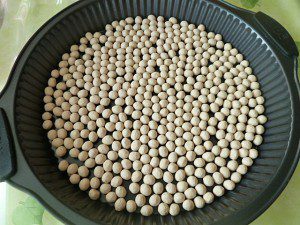 Otherwise, use ceramic baking beans or even some clean pebbles to line a pie or tart tin – perfect! See picture below. Preheat the oven to 180˚C (350˚F) and place your pizza stone or baking sheet in to heat up. Mix yeast with 1 tbsp tepid water, too warm will kill the yeast. You’ll get a watery mix. 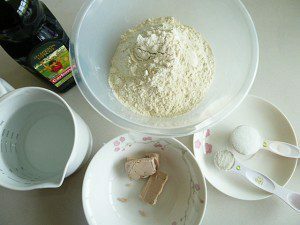 If using dry yeast, mix in with flour. Sift the flour into a tabletop mixer bowl, attached with dough hook. Or if doing by hand, in a large bowl or on a clean work surface. Add the rest of the dry ingredients & mix lightly. Gradually, add the yeast, water, then the oil and knead for 10 minutes until the dough is smooth and shiny & fairly sticky. Don’t add all the water immediately, only as needed. It should be a fairly soft dough. 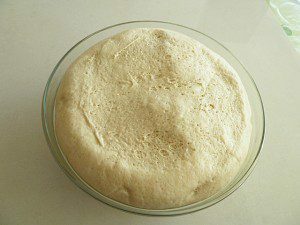 Transfer the dough into a large greased bowl, turning the dough all around to coat with the oil. Cover with cling film and let rest for about an hour in a warm place, until double its size. Divide the dough into 6 parts, cover with a damp tea towel & let rest again, this time for just 10 minutes, the dough will still spread. 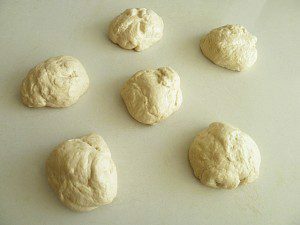 Roll out each dough with plenty of flour, into a fairly thick circle, don’t worry about the shape. Bake at 180˚C (350˚F) for about 10-12 minutes. To achieve the burnt effect, using tongs, hold the baked bread over an open flame for just a few seconds each side. Serve with any form of curries & Indian type vegetable dishes.